Keep your pets visible in the dark with this LED collar. It is made of nylon tape and offers two luminous modes of long bright flash and slow flash. This LED collar make walking your pet safer at night and is suitable for large, medium and small pets. 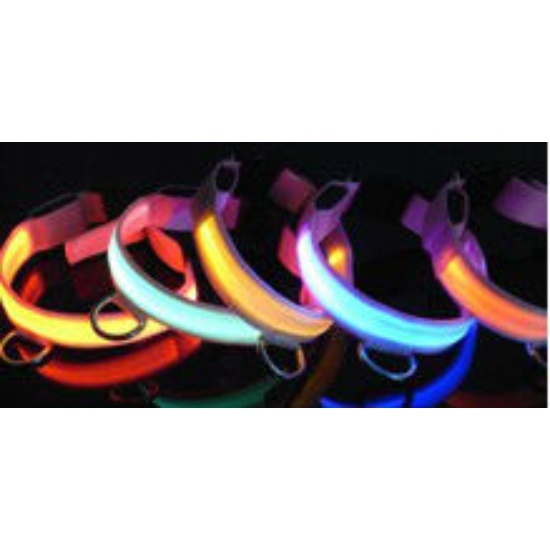 LED fishing wire flat fiber optic light collar. Fiber style light-emitting principle: LED lights glow through fiber optic light. Luminous mode: long bright flash - slow flash. Keep your pets visible in the dark. Make walking your pet safer at night. Suitable for: large medium and small pets. Orange and pink color is more bright in the dark.